Your readiness to grab the opportunities that evolve with a change is vital to be a winner in this digitally driven world. Digital transformation has demanded processes, environment and ideas to evolve constantly and organizations have adopted agile methodologies to develop a software to meet the ever-evolving needs of digital transformation. As Software Development practices transformed from sequential models such as “Waterfall”, to iterative and incremental models such as “Agile”, traditional way of doing Software Testing became tougher. Agile methodology takes critical functionality as the highest priority and develops and releases them first, welcomes changes alongside new functionalities in later releases as the development progresses. Agile teams can become successful when they constantly evaluate and improve their processes that welcomes re-evaluation of priorities and strategy with a change. Agile development is amid adaptive planning with minimal documentation and focuses on early delivery to solve a problem with continuous bug fixes and continuous enhancements, which leads to more and more frequent and faster software releases. Thus, testing strives to keep up the pace with tight deadlines and face hurdles in achieving the highest quality possible for every release. Why Agile Demands Doing Exploratory Testing? Testing teams have a test plan, according to which they create test cases and execute the test steps defined and report the defects by comparing the actual result with expected result. This process is more focused on validating the application under test (AUT) against defined requirements. But applications that live in the digital world should be ensured to deliver affable user experience. The iterative nature of Agile throws testing team a challenge, testing the same again and again whenever there is a change, and testing faster to give quicker feedback. Test Automation has emerged to save a lot of time and effort on testing a functionality repeatedly against a bug fix or a change. But Automated Tests are more inclined towards validating a functionality against a change or a bug fix, they don’t aim to uncover defects that halt end users having a satisfied user experience while using an application. Therefore, it’s evident that Agile demands doing some kind of testing alongside usual Manual Testing practices and Automation Testing practices to achieve frequent and faster software releases with the highest quality. Exploratory Testing, one of its kind testing type, which has a similarity with ad-hoc testing, but makes the differentiation with a structured though process of finding defects with an analysis of previous test results of manual testing and automation testing. Agile projects demand exploratory testing is because of the flexibility and quickness that it offers, which is the same that agile promises. 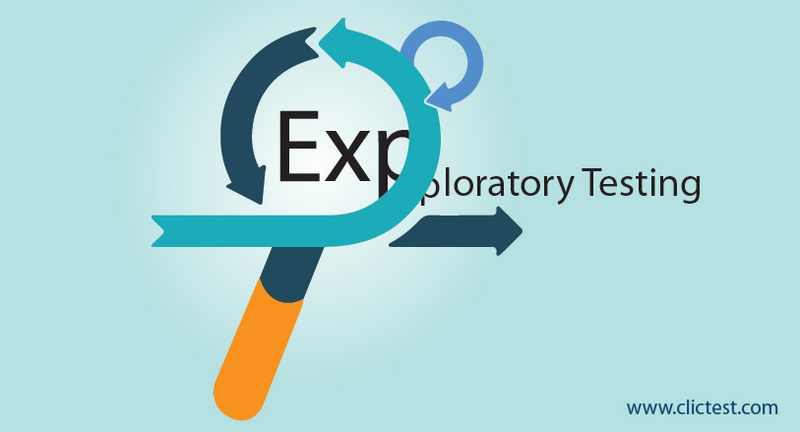 Exploratory testing is a testing process where test design and test execution are done at the same time. Exploratory testing participants are not just limited to testers; product owners, subject matter experts and business analysts are also welcomed to participate. Testers, we are talking about manual testers not automation test engineers who are similar to developers, leverage their testing skills, knowledge and previous experience in learning the “AUT” and in exploring the application for defects. Exploratory Testing success depends on the participants’ ability to comprehend AUT and use different personas of users who will be using the application. Business analysts, product owners and subject matter experts, who understand the AUT better, are the right participants in exploratory testing as these people bring different perspectives of exploring an AUT to the table. Tips on How to Get Most Out of Automation Testing? ClicTest serves as a tool to improve your software test coverage and deliver a quality software. A single solution for all kinds of software testing needs is just one aspect of competitive advantage ClicTest has, there are a lot than other that. Please reach us for detailed information.